For as long as I can remember athletics have always been a huge part of my live. Growing up in Texas with a father who coached high school football, I learned very early the importance of a strong work ethic. Over the years, I had a front row seat to the highs and lows of competition, but what I remember the most was learning to appreciate and respect the time and commitment required for athletic achievement. An athlete’s motivation may be intrinsic, induced by peers/parents, or derived from other extrinsic rewards. I believe it’s important to recognize the source. Competition as we know it revolves around bragging rights and material accolades, but the biggest piece of advice I can give parents of children starting organized sports is to facilitate the love of the game. A true internal desire will promote steady growth leading to greater satisfaction and sense of achievement in the long run. Instead of focusing on the number of points scored or how well your child played compared to others, focus on what they enjoyed and encourage them to keep trying their best. Children who are feeling the pressure or feel consumed by sports early on may develop resentment and drop out before they even hit their full potential. Being a little league MVP is trivial in terms of long-term athletic success. Lay down a foundation of support and be patient. Don’t rush it. Instill values of strong work ethic, coachability, discipline, and good sportsmanship. Introduce your children to variety of sports and other extra-curricular activities and let them decide what they enjoy and where they want to spend their time. I did not start playing competitive sports until the age of 15 when I decided to try out for a local club volleyball team. I was more mature, focused, and prepared to commit my time to playing. This was also the time where my love of the game started to grow. After the regular high school season, I continued to play elite volleyball through the winter – spring – and summer months. I spent several nights a week practicing, as well as, numerous weekends competing in national-qualifying tournaments. 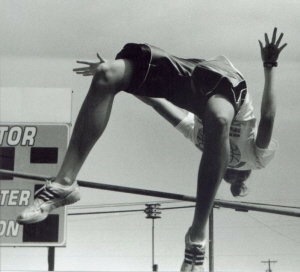 In addition to volleyball, I was a high jumper during the track season. I qualified to compete in multiple state championships, earning two silver medals, and a gold in 2007. I got into a great routine of juggling the demands of sports for a long period of time but towards the peak of my high school career, I started showing signs of perfectionism and low self-esteem despite my achievements. On paper, I was successful. I was ranked the 4th best senior volleyball player in the entire country. I had boxes of recruiting letters arrive at my doorstep each week, but deep down something was missing. I was getting tired and I was starting to feel the pressure. I didn’t recognize it then but I was starting to show the early signs of burnout. According to the National Athletic Trainers’ Association (NATA), “Burnout is a response to chronic stress of continued demands in a sport or activity without the opportunity for physical and mental rest and recovery. Burnout is a syndrome of continual training and sport attention stress, resulting in staleness, overtraining and eventually burnout.” Are you showing the signs of burnout syndrome? Check out the NATA’s list of physical and mental signs below. In the summer of 2008 I became a Nebraska Cornhusker. I entered a new level of competition and became exposed to a new paradigm of training. Very quickly I learned that with hard work comes recovery. I was introduced to a nutritionist, met one-on-one with a strength coach, and became very familiar with the training room ice bath. We met with physical therapists who evaluated our stature and biomechanics, in addition to athletic trainers who helped perfect our jumping, squatting, and running form. Proper hydration, sleep, and the supplementation of vitamins was mandatory. Instead of abusing my body, I started respecting it. For the first time in my life I saw a difference between a competition period and a training period. At Nebraska, the goal was to be the best during the peak of competition season. To avoid overtraining, the frequency/intensity of practices and strength/conditioning sessions changed throughout the year using the concept of “periodization”. This continuum of training varies the levels of training intensity throughout four different phases of the athletic year. Since entering the “Club of Retired Athletes”, I still uphold the values of proper training and strive to share my knowledge with others as a physical therapist assistant so that others may also avoid athletic burnout. Stay tuned for my next blog post where I break down my top 10 tips YOU can implement to avoid burnout and enjoy your sport! This entry was posted in Allison Blog, Blog, Marketing. Bookmark the permalink. WAnt more articles and tips to your inbox?